Leland ‘Lee’ Erbe of Otsego, MI passed away Saturday, June 16, 2012 in Kalamazoo. Lee was born November 4, 1930 in Port Sanilac, MI the son of Howard and Myrtle (Pohzehl) Erbe. Following high school Lee enlisted in the Army and spent 3 years in Germany during the Korean War. Following his time in the service he met and married Sylvia (McLane) on May 15, 1954 in Sandusky, MI. He began working for International Harvester out of Saginaw and had opportunities in different states as he moved up the ranks until he purchased his own truck dealership in IL in 1967. He sold the dealership in the early 1970’s so that he and his family could move back to Michigan. Back in Michigan he stayed with IH until 1980 when he began working in sales permitting for Natural Gas Exploration until his retirement in 1990. He continued to stay busy volunteering to help people in need. Lee and Sylvia spent winters in Lake Travis, TX. 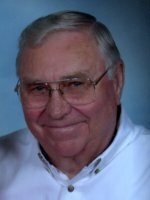 He was a member of the American Legion, VFW, Elks and was a faithful attender of the First Congregational Church of Otsego. Lee enjoyed golfing, playing cards, and his morning coffee with his buddies. He loved spending time with his friends but most of all his family. Once he made a friend it was important to Lee to keep in touch no matter where they lived. Surviving are his wife Sylvia; his children, Allyson (Ian) Davidson of TX, David (Melisa) of TX, Scott Erbe and Paul (Heather) Erbe both of Kalamazoo; 8 grandchildren, Joshua, Jonah, Collin, Alexandra, Sebastian, Atticus, Ethan and Evan. Lee was preceded in death by his parents and by an infant son, Thomas. Cremation has taken place. A memorial service will be held on Saturday, June 23, 2012 at 11:00am at the First Congregational Church, Otsego with Pastor David Youngs officiating. Military Honors by VFW Post #3030. Burial of ashes will take place at a later date in Greenwood Cemetery, Sandusky, MI. Memorial contributions may be made to the First Congregational Church or the Lutheran Hour.